Welcome to the latest edition of our "All About Apps" series! In today’s digital world we have phones, tablets, laptops, desktops, etc., and there are times that we will need to charge our phone or we are not near it. Now imagine, you are at home or work and an important text message, email, or call comes and your phone is in other room or in your desk; you missed it because you were not aware. This happens to people more often that you think and now there is an app that can solve this problem for you called Pushbullet. Pushbullet is a service that allows you to connect all your devices and essentially make them one. From seeing your phone's notifications on your computer, to easily transferring links, files, and more between devices, Pushbullet saves you time by making what used to be difficult or impossible, easy. With headquarters in San Francisco, Pushbullet was founded in 2013 by Ryan Oldenburg, Andre von Houck, and Chris Hesse. According to Pushbullet, it originally started as a side-project that bridged the gap between our phone, tablet, and computer so they would work better together. What services does Pushbullet offer? All of this can be done from your computer or tablet without having to locate your phone and the other party will never know that you reply to them from your computer. It is very simple to use and would be great for anyone who uses the computer a lot. Pushbullet is great in my opinion when it comes to syncing all your notifications and SMS messages to your laptop or computer. 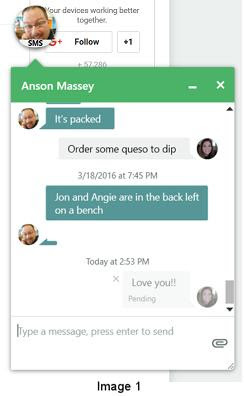 When you get a text message, a box will pop up and just like messenger for Facebook it has a chat head. The chat heads are great and are only available via the computer. This app is not quite perfect; it does have some issues with updating the text messages on Pushbullet with what is on your phone. I have chalked it up to a bug in the system as here lately they have been experiencing issues with their server. However, with most apps that you get, there will be a few bugs and Pushbullet developers are very quick to fix the problems. Yes! I feel this app is great to use and will continue to be useful. The free version is great to use unless you decide to text more than 100 times a month from your computer or tablet. The best thing to do would be to try out the free version for a few weeks before you decide to get the paid version. In all honesty, I have been using Pushbullet free version for a month now and I am on the computer a lot, so I wouldn’t benefit from Pushbullet Pro as I am not sending over 100 text messages from my computer. However, this is a great tool to have on a business computer so you are not always checking your phone for that important text message. Pushbullet has a free version and a paid version. The free and paid versions of differ in many ways. Pushbullet Pro is $3.33 a month if you pay yearly, which ends up being $39.99 per year. However, if you want to pay monthly for it then it will be $4.99 a month, which all transactions are paid with credit card or PayPal. First off go to https://www.pushbullet.com and setup an account. The next thing you will do it download the apps for your phone, tablet, or computer. After that there will be some basic setups for your device and then you will be ready to go. About the author: Jenniffer Cox is a senior business administration major at Tarleton State University. You may find her on Twitter @jkjenn1980. Pushbullet. (2016). About Us. Retrieved March 20, 2016. Pushbullet. (2016). Pushbullet - Your devices working better together. Retrieved March 20, 2016. Pushbullet. (2016). 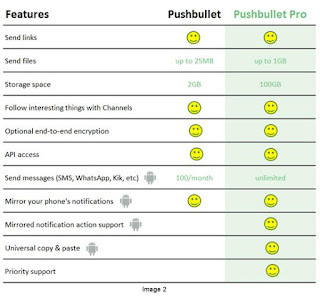 Upgrade to Pro | Pushbullet. Retrieved March 20, 2016.